Software: NetEnt, Microgaming, Endorphina, and BetSoft. Omnislots Casino is a NetEnt casino that is owned by DialInvest N.V. The company is licensed in Curacao. Omnislots Casino has a wide array of slots and casino games from some of the top casino software developers, such as: NetEnt, Microgaming, Endorphina, and BetSoft. Check out the Omnislots Casino Review below for Welcome bonus information, as well as deposit and withdrawal information. 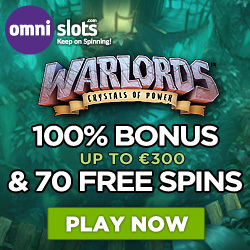 New players at Omnislots are eligible to receive our Exclusive Welcome Bonus of 100% up to €300 + 70 Free Spins on the Warlords: Crystals of Power Slot*. Please note that this offer is Exclusive to our players only! Remember to use our links on this page and special bonus code to access your Exclusive Welcome offer. *The minimum deposit to qualify for this EXCLUSIVE offer is €20. Sign up for a casino account at Omnislots Casino. 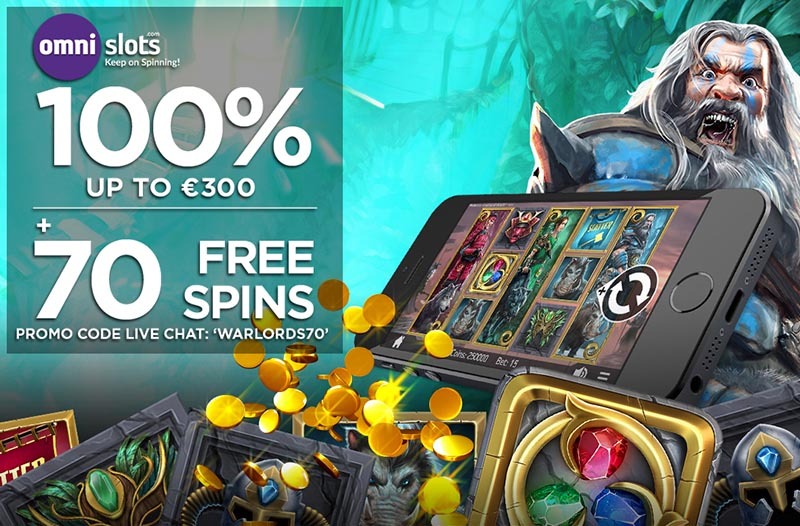 Open up the Warlords slot to play your 70 free spins. Note that the minimum deposit to receive this offer is €20. Different game types contribute differently towards wagering fulfillment. Bets placed on slot games count 100%, table games count 10% (roulette, baccarat, craps, sic bo count 0%), scratch cards, and live casino games all count 0%. The maximum bet is €5 when bonus money is active. 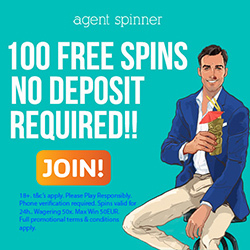 Free Spins are only valid for 3 days, so must be used within this time frame, after they have been given. Players from the following countries are restricted from opening an account or playing at Omnislots Casino: United Kingdom (UK), Cyprus (CY), Curaçao (former Netherlands Antilles), Canada (CA), France (FR), Italy (IT), Spain (ES), Turkey (TR), Israel (IL), United States of America (US) and all of its territories such as American Samoa (AS), Virgin Islands (American) (VI), Guam (GU), Puerto Rico (PR), Northern Mariana Islands (MP), and United States Minor Outlying Islands (UM). Neteller, Skrill, Entercash, Zimpler, Verkkopankki, BitCoin, SafetyPay, iDeal, AstroPay, Boleto Bancario, VISA, Mastercard, Diners Club, Sofort, Trustly, Qiwi, POLI, Teleingreso, Przelewy24, PaySafeCard, Giropay, eps, and TrustPay.